Many people who do not have dyslexia think they understand the condition. Maybe they’re aware of its scientific meaning. Perhaps they’ve had classmates, friends, peers diagnosed with dyslexia. Richard Branson is an example of a celebrity with well known dyslexia. Today’s infographic explains exactly what reading with dyslexia is like- and what one font designer is doing to help. Anyone who has delved even a tiny bit into the world of typography and fonts knows it’s a fascinating area, one which even inspires people to write definitive guides in order to explain it. The font Dyslexie, designed by Christian Boer (who is himself dyslexic), isn’t based on aesthetic or stylistic concerns, however; its purpose is to make reading easier for people with dyslexia. Instead of integrating visual signals from both hemispheres of the brain as most readers do, dyslexic readers must rely only on the left hemisphere to do all of the heavy lifting. This means that 2D letters can appear as 3D objects that spin, tip over, or otherwise flip into ‘twins’ of themselves, and appear to be a different letter entirely. Dyslexie battles this issue by weighting letters down, widening their open spaces, and giving them unique features. Best of all, it appears that this new font may really be a game-changer: 81% of dyslexic readers felt they could read faster, and 73% said they made fewer letters. It turns out something as simple as a font can make a huge difference. Take the Shih Tzu for example. This apartment dog breed has no problem spending its time at home on the couch. If watching TV isn’t enough, you can always play hairdresser with them, as they do require some regular grooming. The gentle Bulldog is another pooch who’d prefer sleeping over adventurous play. Want something a little bigger? Get ready to be pleasantly surprised by the Greyhound’s laid back personality. Although they can run at speeds of up to 45 mph, they would rather lay next to you and know that you’re happy to spend time with them. If you have more space, then you may prefer other popular dog breeds as well. Even if you live in an apartment, you don’t necessarily have to convert to cats. Plenty of options are available for dog lovers. Just make sure to hide your shoes before you leave for work. Directly or indirectly, most people have had some experiences with ad agencies — a structured system of different individuals that bring your ideas to life. But there’s so much more to them than just position titles. This tongue-in-cheek infographic adds a little more personality to the daily life ad agency personnel. Let’s start with the accounts manager. They spend most of their day on the phone trying to persuade customers that less work for more money is the only way to do things. Accounts people also have the tall task of making clients understand that their expectations are unrealistic. Not everyone on board is the social type, so to speak. The developers spend most of their time coding, looking for an isolated room to hide in, and more coding. Also, they tend to quietly question their co-workers’ intellectual capacity. Power to you, developer! In every business, there must be a money guy. In agencies, that’s the finance department. They calculate to see where to spend money and when to invest. In a fun way, these different personalities mesh together quite beautifully to bring your idea to life in a compelling ad campaign. It’s just a well-oiled machine that runs on stress and hard liquor. Are you thinking about getting your feet wet in the blogging waters? Here’s everything you need to know about becoming a fashion blogger. Glamour, here you come! Blogging doesn’t only work as a creative outlet: it can even be a full-blown career if you put the effort and learn the ropes. Whether you want to be the new fashion blogger in town or boost your start-up, a blog is a great place to start. You can showcase your thoughts, express your opinions and build a community centered on the things that are most important to you. All of this, plus making a decent income, sounds pretty appealing, huh? Nevertheless, the vast array of options out there might be a little daunting. It’s essential to get focused and choose content, both text and visual, that fits your marketing strategy. For fashion bloggers, top performing posts include how-to guides, top 5 (or 10) lists, and blogs on your outfit of the day. Get the nuts and bolts of fashion blogging down, add in social media marketing, and watch your blog grow. You’ll be invited to NY Fashion Week in no time! Are you ready for the most glamorous life ever? 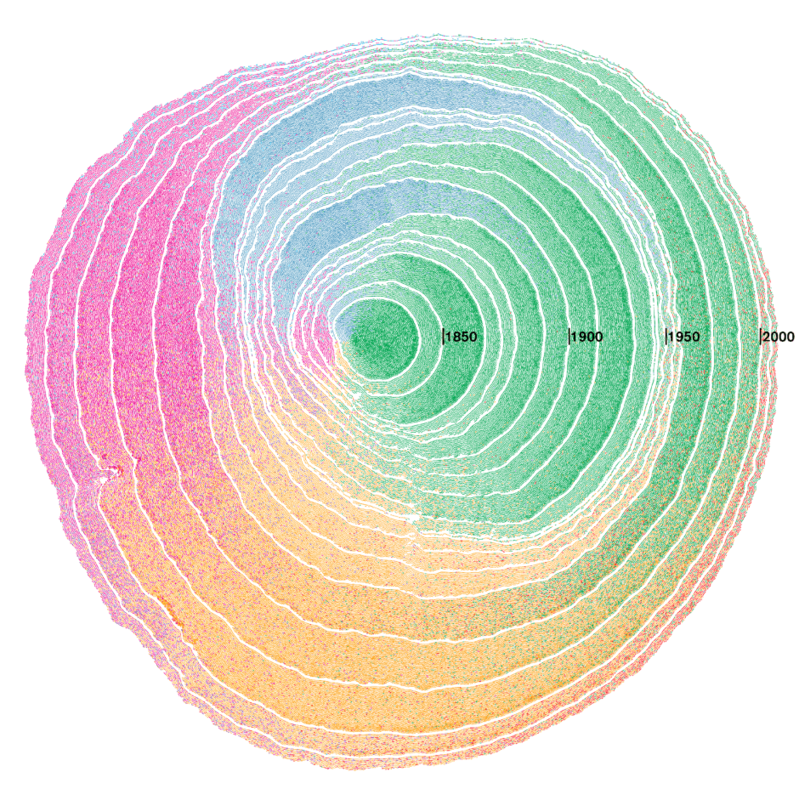 Dendrochronology may be the most interesting word you’ve never heard before: it is the scientific method of dating tree rings to the exact year in which they were made, which is how scientists determine the age of our planet’s oldest trees. What if this fascinating niche area of science could be used to visualize consecutive waves of immigration? That’s exactly what this video does: in this model, the United States is the tree, hundreds of years old, and its cells are made out of immigrants. As immigrants arrived, the ‘cells’ they make up are shown as rings, which give a visual representation of each wave. Census questionnaires were used to collect the data for the visualization, and a computational algorithm deposited each tiny ‘cell’ in the appropriate place. Each ring is coded in terms of colour and the direction in which it extends, in order to show the origin of that particular immigration wave. For example, European immigration is green and extends to the right of the image, and large European waves are visible between 1850 and 1950. Immigration from Latin America is coded orange, and extends to the bottom of the image. The study shows that Latin American immigration picked up in the latter half of the 20th century, between 1950 and 2000. Besides its obvious usefulness, the visualization offers a great metaphor for immigration to US, as it shows the way each wave has led to the country growing and evolving. Do you want to increase your digital presence and snag a better job? Optimize your LinkedIn profile for social selling, and you’ll get measurable results. From getting that promotion to just keeping your current role or changing industries completely, professional networking through social media is essential. Keep it professional. Don’t mention unnecessary personal information that won’t add anything to your profile and could hurt your chances. Take a good profile pic. LinkedIn profiles with pictures increase their InMail response rate by 40%. Use headshot that’s a high-resolution image. Summarize it up. Aim for 3 paragraphs with 3 or fewer sentences each. Don’t forget to include keywords. Remember to fill out your LinkedIn profile in its entirety. Then add a call-to-action at the end to encourage potential employers or recruiters to contact you. Apply these tips to turn your LinkedIn profile into the best work tool at your disposal. Has your inbox been flooded with emails about changes in privacy policies? I know mine was. All of those emails stem from the start of the General Data Protection Regulation, AKA GDPR. So what exactly is it and how does it affect you? The GDPR is a legal framework meant to protect the personal information and data of European citizens for transactions happening within EU member states. Thus, all companies dealing with EU citizens’ information are bound to it, even if they don’t have EU headquarters. The GDPR replaces the old 1996 Data Protection directive, mainly because of the quick changes happening due to the digital age. The former instruction fails to address new data concerns in the digital world, it was fine in 1995, but outdated by 2019 standards. For EU consumers, the GDPR ensures their right of erasure, AKA, their right to be forgotten. This means that an EU citizen can request their data to be removed. On the other hand, it also helps consumers to know when their data has been collected and whether or not they can opt out of it. Businesses dealing with EU customers had two years from 2016 to 2018 to make their databases comply with the new regulations. The deadline was October 2018, hence the multitude of emails in the later part of the year. As for US-based consumers, it doesn’t change much. Except to serve as a reminder that large digital corporations undervalue our privacy. However, stay tuned as states, like California, introduce privacy laws similar to the GDPR. The internet era has changed not only how people communicate, but also how they see the world. But has it even changed the way we eat? World-class restaurateurs share their take on today’s infographic. The internet and more specifically social media are everywhere nowadays. Come on; people even go to the bathroom with their smartphones! Although it has this ever-present quality, most of us don’t fully realize how it changed the world we live in. But think about it for a minute: when was the last time you went shopping at a brick-and-mortar store instead of looking for the item online? When was the last time you spent a whole weekend without using the internet? Probably a long time ago, like when you were grounded at 14 years old (or was it only me?). Bathroom or not, pretty much every daily experience in our lives has something to do with our online presence. This is such a strong trend that restaurants take into account our digital lives to keep their businesses alive. It’s undeniable that internet trends, like viral posts and witty tweets, have a significant say on the success—or failure—of innovative food trends, fast food chains, and typical upscale dining places. In fact, restaurant people even have a small formula: apparently, all we need to be fans of a new restaurant is for it to have pretty walls, neon signs, a good “instagrammable” wall outside, cute plates and interesting floors. And the food, right. We’re simple people, ya’ know? Are you curious about what restaurants do to hook this digital generation? Check out today’s infographic! Influencers have been all the rage for a few years now, and the trend doesn’t seem to be stopping at any point soon. Just a decade ago, the word “influencer” was unknown to most people. Nowadays, it’s an entirely different story. Given that around 40% of the world’s population uses social media tools, someone who has a loyal and active following can be an asset for any business. Thus, the business of selling your personal brand to promote products or other companies is growing by the minute. Every day more “traditional” businesses are looking at influencers as a way to target a more focused group of possible customers in a way that is more efficient and cost-effective. Being an influencer (or hiring one) has become such a big part of marketing that Influencer Agencies are on the rise, and most influencers you see online actually have managers and agents that handle their business, sponsorships and brand deals. If you want your brand to be more personable and relatable, it might be worth it to try your hand at influencer marketing. Still unsure? Check today’s infographic with the most significant influencer benchmarks of 2019: get on with the trend or risk your chance at more exposure! Animal species are seeing their populations perish now more than ever. Overpopulation and consumerism lead to issues like deforestation and climate change. The effects are quite discouraging, as some of the most famous animal species are currently fighting for their existence. A very sought-after item, the rhino’s horn has been the reason for the animal’s poaching numbers growing exponentially in the past decade. From 1960 to 1995 about 98% of the Black Rhino population has ceased to exist. Orangutans share over 96% of their genes with humans, which is why they’re known as the man of the forest. Unfortunately, they are hunted in the wilderness in order to be domesticated as pets in places like Taiwan. Every time one is captured, 3-5 die in the process. This trend is unsustainable, as females give birth to one every 3-5 years. The Amur Leopard’s breathtaking beauty hasn’t gone unnoticed by poachers. Originally from Russia, the animal wears an exquisite coat, which can cost up to $2000. Currently, there are around 80 of them remaining. The Earth’s equilibrium has been completely thrown off in recent history. Overhunting, overfishing, and rising temperatures are only some of the reasons why nature heading into a critical state. What humans may not realize is that we are intrinsically tied to this planet and all its lifeforms. The question is, what can we do about it? There are plenty of ways to contribute. Demanding more responsibility from corporations, cutting down on beauty product consumption, and helping various organizations are a fraction of the ways we can be effective. So next time you enjoy nature’s magic, think about what’s currently at stake and make a positive impact. Studies have shown that people who laugh more have experienced reduced pain in medical procedures due to natural endorphins from the brain. It’s also proven that increased laughter decreases stress, and allows the individual to have better sleep quality. It can also lead to a healthier heart! The great thing about it all is that laughter is free, available, and has no side effects. It’s genuinely just a harmless, joyful activity that anyone can partake in. When you’re feeling down, laughing can improve your mood. It isn’t easy, but try to find humor in every situation—find ways to make yourself laugh. And I’m not saying that you should sit in your room and just cackle to yourself (although that would probably work). Instead, read some funny comics or be goofy with your friends. We cheer up others best when we make jokes to get them to crack a smile. So don’t hold your laughter in—think of your health. Maybe don’t be that person who laughs at everything, but if you find something genuinely funny, you should laugh! Hahaha! Romance. It’s exciting, scary, intimate, and costly. In a society that tends to focus mainly on the positives of love–the hugs, kisses, and big romantic gestures–it’s easy to overlook the price it comes with. We’re often shown that if we find the perfect partner, we’ll be fulfilled and happy. But that’s a naive and unrealistic way of viewing romance. Being in love doesn’t mean life is going to be perfect, there are still so many things to worry about–stability, compatibility, jealousy, distance–it often leads to even more problems. So is it worth it? Emotionally, physically, financially? Maybe before tumbling head-over-heels in love with someone, it would be wise to consider how much falling in love can cost us, and worst-case-scenario, how much falling out would too. This infographic focuses on the monetary part of love, starting from courting, to going on dates, the proposal, then marriage, and all the problems that normal married couples go through. Maybe for some people, it ends there. But some choose to go down the path of divorce, and the infographic covers that too. So take your time to fall in love, be careful who you choose, make sure you’re happy, and consider the costs. In the end, I hope we all find that love is worth it. Prom night is as American as bacon and eggs. But how did this tradition come to be? Prom began as a way to reinforce manners and poise in young people. Prom is short for “promenade,” which is what we called the first proms. In the late 1800s, Ivy League students attended a presentation week that included a dance in formal attire and a concert. Back then, prom nights served as a way to meet up with those of the opposite gender, as it was common to attend an all-male or all-female school or to have no formal education. From the beginning, prom was an expensive event, and not everybody was able to attend. In the early 1900s, prom events reached high schools. These proms aimed to promote socialization and good behavior while serving as opportunities to mingle under the careful eye of chaperons. By 1930, proms were widely accepted throughout colleges and high schools alike, turning out to be one of the most important events of the school year. Fast forward to the present day, where after a slow season in the 60s and 70s, prom is again all the rage. From taking grannies to prom to crowning a King with Down’s syndrome, prom is more inclusive and open to the new times. Maybe it will even survive another century! Get ready for this prom season with these easy tricks, and make your prom a magical night. Advancements in healthcare and technology have allowed for a dramatic bump in our life expectancy. So how come a developed country like the United States has seen a downward trend in its mortality rates? While the trajectory of other countries’ average life expectancy seems to be getting better at a steady rate, Americans are reaching a plateau at 78.9 years. Countries like Japan and Switzerland are seeing their citizens enjoy a life of over 80 years old. 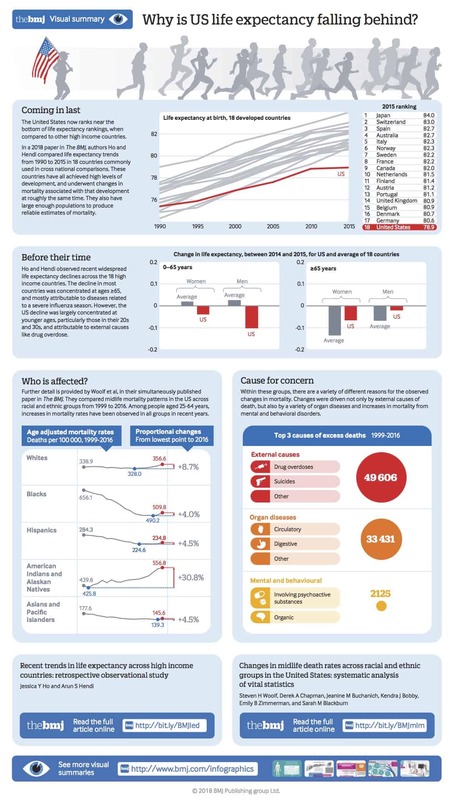 Digging a little deeper, findings show that there is a negative change in mortality among the elderly in most developed countries. The only country that has seen this downward trend among people younger than 65 is the US. No discrimination among the different groups can be seen, as all races have experienced a drop in their life expectancy. The rates vary anywhere between 4-30%. Unfortunately a country’s economic success inevitably brings with it consumption of drugs, unhealthy food, and mental problems. This has had a major impact on the US population. It’s no secret that the opioid crisis has been contributing to shrinking lifespan. With access to better healthcare and technology, developed countries should be seeing improvements in their mortality rates. Statistics like these show us that no matter how much innovation and wealth we have, it all comes with a price. We all have that one pair of jeans that fits perfectly and works with just about any outfit combination. Unfortunately, nothing can last forever, including those amazing jeans. The good news is that there are some ways you can keep them fresh for a long time. Even though it sounds odd, not washing your jeans is actually beneficial to their longevity. But if you can’t wash them, how do you keep them clean? One way is to freeze them. Put the jeans in your fridge for several hours and defrost them before you put them on. This may be a good idea for the dog days of summer. Another approach to cleaning them is by using alcohol. Diluting vodka with water gives you an effective weapon in the fight against musty smelling jeans. The good news is that it doesn’t have to be an expensive brand of vodka. In case you absolutely have to wash them, be sure to use cold water and turn them inside out. Hand washing is highly recommended. For better or for worse, you can never be completely clean for your dates. You can, however, freshen up your favorite pair of jeans. Just be sure to air them out from that vodka so people don’t get the wrong idea about you.